Glenn Irwin was taken to hospital following a crash at Donington Park. Glenn Irwin has been injured following a crash in free practice at the opening round of the Bennetts British Superbike Championship at Donington Park on Saturday. The PBM Be Wiser Ducati rider came off at Goddards, resulting in the session being red-flagged with three minutes remaining. He was later transported to the Queen's Medical Centre in Nottingham for further assessment. The 28-year-old Carrick rider provided an update on Twitter, writing: ‘I’m ok got broken neck on just on way to hospital to check my neck and back. I’ll be back ASAP’. 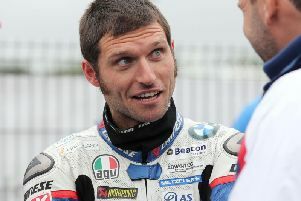 Irwin had clocked the sixth fastest time in the wet practice session before his crash. His team-mate, Shane ‘Shakey’ Byrne, led the way from Jake Dixon (RAF & Reserves Kawasaki) and Kyle Ryde on the CF Motorsport Yamaha. Carrick's Glenn Irwin on the PBM Be Wiser Ducati. Tyco BMW’s Michael Laverty was 10th fastest.